The Carmelite Order is one of the few religious institutions that still maintains the full religious habit in some of its convents. In others, different versions of the habit have been adopted, depending on how much the nuns have adhered to Vatican II's adaptation to the modern world. Thus, one can find all the steps of this process in it. This makes the Carmelite Order, principally its feminine branches, a priceless object of study to see how Progressivism worked this transformation that aims to destroy the millennial Carmelite spirit. We selected photos of convents in different parts of the world to illustrate the steps of this decay. We note in passing that this same process is taking place in all religious families. 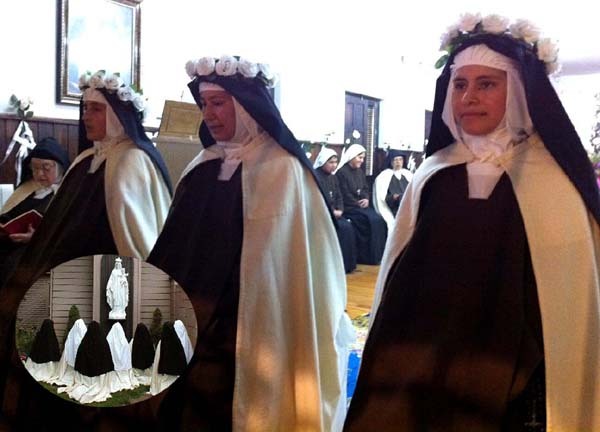 Above, we see three nuns in full Carmelite habit shortly before their solemn profession of vows in the Convent of Carrión de los Condes, Spain. Their faces are framed by the wimple that covers their heads, foreheads and necks under the black veil. A beige mantle is worn over the floor-length brown habit. The veils and mantles can be better observed in the insert at left depicting Carmelites of Colorado Springs kneeling before Our Lady. In the larger photo, the nuns wear crowns of white roses, symbolizing they are becoming virgin spouses of Christ. This is how Carmelite nuns should be. In the first row below, we can observe the first step of the Conciliar Revolution: The habits were shortened allowing their lower legs to be seen - check the insert. The white wimple has gone. The modified veil diminished considerably in size and permits some of the nuns' hair to be seen, giving them a worldly look. In the second row, we see in the ensemble of Carmelites in Chile the next step of the process. The veils have been almost abandoned, replaced by short matronly hair-styles. Needless to say, this concern with hair appearance must have introduced into the convent mirrors, styling tools and cosmetics that were never before seen in monastic life. The habits also were abandoned. The nuns wear brown skirts that allow a good part of their legs to appear. One cannot help but imagine these matrons shaving their legs once or twice a week to keep them presentable. The rude sandals were replaced by short pumps. Their white blouses open at the neck, and one nun on the left end is already wearing a short-sleeved blouse. The religious women are allowed to wear black or beige sweaters or vests. Another shocking fall can be seen in the photo of the Carmelites of Brazil in the third row. The habits were reduced to a beige T-shirt imprinted with a cheap logo but even here there is not complete uniformity: One T-shirt displays a Che Guevara-style Jesus. One nun is wearing blue-jeans, another white pants. It would not be surprising to find others in bermudas or short skirts. The progress of the Revolution can be also observed in the embraces the nuns exchange to show they fit into the optimistic world, where the Cross of Our Lord is banned. The fourth row shows us Carmelites of Reno, Nevada, U.S. The nuns do not pretend to any type of Carmelite uniformity in their dress. They all sport pants and short hair cuts, perhaps to look feminist. They are standing with a man who came to their convent to teach them Hindu practices. The last row pictures a general meeting of the Carmelite Order in Ecuador in 2010. We can hardly say that this is a meeting of the followers of Elias the Prophet, St. Simon Stock, St. John of the Cross, St. Teresa of Avila and St. Therese of Lisieux. With the exception of two nuns who still wear modern veils, the clothing is secular. Perhaps the most shocking point is the "natural" embraces between the men and women, indicating that no prudent reserve is observed between the sexes. Regarding virtue, each is left to his own discretion. All the institutional safeguards for the practice of virtue installed by the Carmelite Order for more than 2,000 years have disappeared. This collection of photos is a useful expression of the fruit Vatican II is producing in the Religious Orders, which used to be the healthiest part of the Church.